Experience the unforgettable Niagara Falls on this 11-hour day trip from Toronto. Learn about the history of the falls in an IMAX movie, take a ride on the Hornblower Cruise (seasonal) boat tour, and enjoy panoramic views from Skylon Tower. Your day concludes with a wine tasting in the Niagara wine region before returning to Toronto in the evening. Your tour bus will pick you up in the early morning from one of three select Toronto stops. As you head to the world-famous Niagara falls, listen as your bi- or multi-lingual driver guide gives you a comprehensive tour of the region. Upon arrival, see the IMAX movie Niagara: Miracles, Myths & Magic, which offers great insight into the exciting and sometimes shocking history of Niagara Falls. 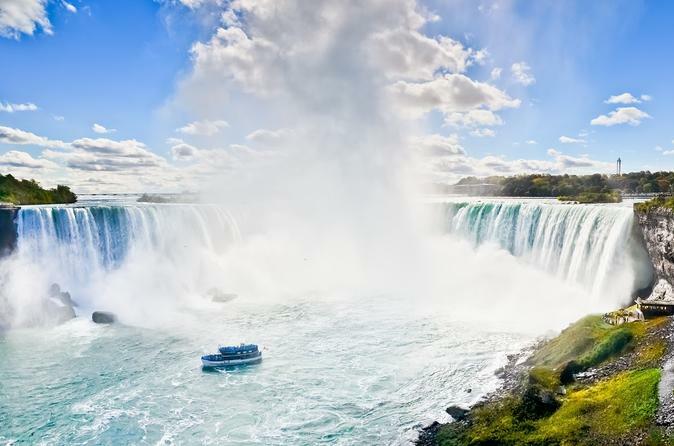 Afterwards, join an optional tour of Skylon Tower for a panoramic view of the magnificent Horseshoe Falls, American Falls, and Bridal Veil Falls. Following lunch (not included), step aboard the famous Hornblower Cruise for a close-up view of the falls. You'll experience firsthand, the thrill and power of the falls. Afterwards, take a tour of Niagara wine country for a taste of the world-famous Ice wine and ginsengs. You'll return to Toronto between 6pm and 8pm, depending on your drop-off location.